Al-Mu'tazz (Arabic: المعتز) (d. 869) was the title of the Abbasid Caliph in Baghdad from 866 to 869. He was only 19 when he was declared caliph by the Turkish Guard, which had previously imprisoned him to prevent him from challenging his brother for the throne. That brother, Al-Muntasir was then deposed and replaced by Al-Mu'tazz. Arab Muslims, furious that Turks now controlled the caliphate and that they had no say in the succession rebelled. The target of their revolt was less Al-Mu'tazz than the Turks who manipulated him but the result was anarchy, the secession of Egypt under a Turkish commander and bankruptcy at the center. The young caliph was killed when the army, unpaid for months, tricked him into allowing their commanders into the palace. The next caliph ruled for a much longer period than his immediate three predecessors but could not reverse the loss of real political power. By 945, the caliphate was a titular post. Yet the office of caliph was more valuable, even as a symbol without much authority than those who occupied held it and would survive for many more centuries. Little very positive can be said about Al-Mu'tazz. He began his reign as a tool of the very people who had earlier imprisoned him. He was no less cruel than others in eliminating rivals to the throne. What can be said is that he did become caliph and that the institution of the caliphate survived to serve a valuable, unifying function within the Muslim world. Even devoid of power, the caliphate still represented the oneness of the ummah. This inspired Muslims to believe that unity and solidarity is Allah's plan, ultimately not only for Muslims but for all people. At its best, the caliphate was an attempt to create a single, God-fearing community of all mankind. To a degree, it sometimes succeeded. Two issues were determining the fate of the Abbasid caliphs at this point. First, the problem of succession. This, by tradition dating back to Muawiyah's designation of his son, Yazid I was by nomination during the previous caliph's life-time, followed by leading citizens giving the oath of loyalty, renewed one the heir succeeded. Harun al-Rashid had actually stipulated that his younger son, al-Amin succeed him but that after his death, his older son, Al-Ma'mun should follow. This did not happen smoothly and Al-Ma'mun had to rebel when his brother took steps to appoint his son, Musa as heir instead. Al-Ma'mun chose to appoint his half-brother, Al-Mu'tasim as heir, by-passing his own son, al-Abbas. Later, al-Abbas rebelled and was executed. The next two caliphs were brothers, sons of Al-Mu'tasim. The second brother, Al-Mutawakkil succeeded without having been nominated due to al-Wathiq's sudden death. Al-Mutawakkil fell victim to a plot hatched by his own estranged son, Al-Muntasir, who had grown jealous of his apparent preference for his brother, Al-Mu'tazz. The fact that several caliphs during this period of decline grew up in prison did not provide them with an adequate preparation for high office. The second problem was the growing power of the Turkish Guard, who carried out the assassination at Al-Muntasir's instigation. Al-Mutawakkil had tried to curb their power. He had removed some of the commanders, transferring their land-grants to others. Al-Muntasir became a puppet-caliph but was dead from unknown causes a year later. Now, the Guards took it upon themselves to appoint his successor. They chose Al-Musta'in, a grandson of Al-Mu'tasim and imprisoned Al-Mu'tazz, to prevent him from rebelling. Unrest followed, not least of all because Arabs resented the fact that the Turks now controlled the caliphate. During the long period of civil unrest that followed, Al-Musta'in fled from the capital. He was subsequently persuaded to abdicate in favor of Al-Mu'tazz, whom the Guards now favored and released. Al-Mu'tazz was placed on the throne by the Turks in 866. Those Muslims in the capital, Samarra, pledged allegiance but in Baghdad many remained loyal to his brother. Others, including Arabs and Persians were unhappy with either; the first because they saw them as tools of the Turks; the second because of their Shi'a convictions. Al-Mu'tazz also found himself surrounded by people who were ready for treachery whether against each other or against al-Mu'tazz. Following the example of no few predecessors, he decided to eliminate the threat from his brother by executing him. He had sent another brother, Abu Ahmed, to subdue Baghdad. It was during the year-long siege that Al-Musta'in had been persuaded to abdicate. He had been promised asylum and a pension but received neither. Now, Abu Ahmed, despite having fought loyally for his brother, is thrown into prison. The Turks attempted to obtain his release but failed. Al-Musta'in's captors executed him, smothering him in a downy robe (or, as others say, frozen in a bed of ice); his body was then exposed before the Court, as if, being without mark of violence, he had died a natural death. Rebellions broke out. a Kharijite seized Mosul, and controlled the city for several years. Defeats followed on the Byzantine front. Several regions withheld revenue payment to the palace. General lawlessness meant that the population suffered from damage to property, crops and lack of food. Funds soon dried up. A Turkish commander, Ibn Tulun, took control of Egypt which subsequently became de facto an independent sultanate. Troops went without pay. The city guards at the Capital surrounded the palace at Baghdad, demanding their stipends. 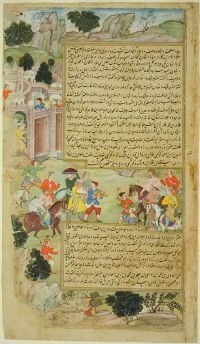 The Governor wrote to al-Mu'tazz for an advance; but he, prompted by the Turks, replied that "if the guards were needed for himself, he himself might pay them; if for the Caliph, he cared not for them." Insurgency broke out. The mob refused to allow the Caliph's name to proclaimed in the mosque, so there were no prayers observed that Friday. Before the revolt was put down, the Governor had to burn one of the bridges, and set fire to an adjoining bazaar, in order to keep the rebels off. The next year all joined together-Turks, Africans, and Persians-stormed the palace for their pay. Salih son of Wasif, one of the rebels, seized the personal secretaries of al-Mu'tazz and demanded the money embezzled or concealed by them. Wasif had led the assassination of Al-Mutawakkil, fearing that he was next in line to be dismissed from the Guard. As the only answer was an empty treasury, they were placed in irons. The Caliph then implored the rebels to release his private secretary, but they were deaf to his plea. The accounts of the unfortunate ministers were seized although nothing could be extracted from them. Salih, and another rebel Musa, planned to depose al-Mu'tazz, and carried out the plan with what William Muir describes as "brutal inhumanity". Followed by a troop shouting the caliph's praise, they seated themselves at the palace gate, calling for the him to come out. Not suspecting treachery, he invited them in. Entering, they beat him with clubs, kicked him, then dragged him by his torn robes outside. He was forced to abdicate in favor of Al-Muhtadi, declaring that he was unequal to the task he had shouldered. He was then left seated in the scorching heat of the midsummer sun before shut shutting him up in a room, alone and without food or water. Three days later he was dead, at the early age of 24. The Turks installed Al-Muhtadi, son of al-Wāthiq, as his successor. He tried to restore personal authority and dismissed some corrupt officials and members of the Turkish Guard. In response, the Turks laid siege to the palace, then captured, tortured and killed him. The next caliph was a son of Al-Mutawakkil, also released from prison. Advised by a capable brother, he actually reigned for 23 years, restoring Baghdad as the capital from Samarra, to where Al-Mu'tasim had moved his court in 836. Al-Muhtadi would prove to be one of the more competent and also pious caliphs of this era. However, he could not reverse the process by which the caliph was becoming a tool in the hands of others. By 945, the caliphate was in reality a titular, symbolic office with political power in the hands of Sultans. However, the office had acquired a mystique and had an important symbolic value representing the unity of the Muslim ummah. Despite the political fragmentation of the Muslim world into independent sultanates and emirates, the office of caliph would be maintained until it was finally abolished in 1924 as the focus of Muslim solidarity. Like his two immediate predecessors, Al-Mu'tazz did not leave a distinguished legacy due to the volatile circumstances of his day. Not only did the grip of the Turkish Guard strengthen around the caliphate but the empire began to disintegrate. This process proved to be irreversible. Yet the caliphate as an institution was to important to become redundant. The Turks may control the succession at this point but they did not usurp the office for themselves. They knew that only a member of the Abbasid family would be acceptable to many if not all Sunni Muslims. It would not be until 1517, when the Ottomans claimed the title that a Turk would wear the mantle of the prophet. Little very positive can be said about Al-Mu'tazz. He began his reign as a tool of the very people who had earlier imprisoned him. He was no less cruel than others in eliminating rivals to the throne. What can be said is that he was caliph and that the institution of the caliphate survived to serve a valuable, unifying function within the Muslim world. The office was better and more important than those who occupied it. ↑ Ṭabarī, and George Saliba. The crisis of the ʻAbbāsid Caliphate. (SUNY series in Near Eastern studies.) (Albany, NY: State University of New York Press, 1985. ISBN 9780873958837), 34. ↑ 2.0 2.1 William Muir. The Caliphate: its rise, decline, and fall. (London, UK: Routledge, 2000. ISBN 9780415209014), 536. ↑ Ṭabarī and David Waines. The revolt of the Zanj. (Albany, NY: State University of New York Press, 1992. ISBN 9780791407639), 3. Muir, William. 1924. The Caliphate: its rise, decline and fall: from orig. sources. answering-islam.org. Edinburgh, UK: Grant. Retrieved February 24, 2009. Muir, William. 2000. The Caliphate: its rise, decline, and fall. (Orientalism: early sources, v.3.) London, UK: Routledge. ISBN 9780415209014. Ṭabarī, and George Saliba. 1985. The crisis of the ʻAbbāsid Caliphate. (SUNY series in Near Eastern studies.) Albany, NY: State University of New York Press. ISBN 9780873958837. Ṭabarī, and Joel L. Kraemer. 1989. Incipient decline. (SUNY series in Near Eastern studies.) Albany, NY: State University of New York Press. ISBN 9780887068744. Ṭabarī, and David Waines. 1992. The revolt of the Zanj. (SUNY series in Near Eastern studies.) Albany, NY: State University of New York Press. ISBN 9780791407639. This page was last modified on 15 February 2019, at 15:08.